Lidl have been selling their own brand (Eirdanous) Greek food (moussaka, halloumi, meatballs, yoghurt etc) with a doctored image. Perhaps it wouldn’t matter if they’d made the Aegean a little more turquoise or photoshopped the beggars out from around the Parthenon. 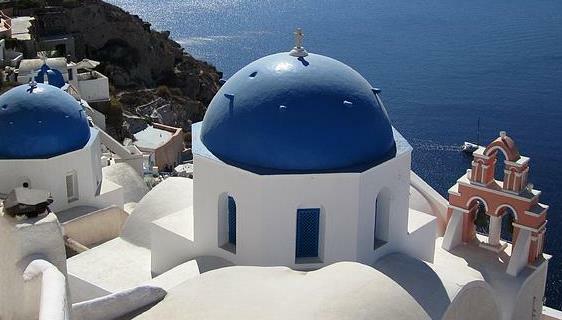 But they decided instead to remove a cross from the sapphire blue dome of an Orthodox church in Santorini. Premier have the story, and they contacted Lidl UK for a comment: “We are extremely sorry for any offence caused by the most recent artwork and would like to reassure our customers that this is not an intentional statement,” they responded. 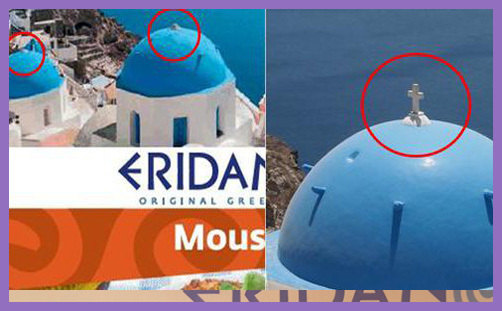 So someone at Lidl HQ accidentally took to Photoshop and unintentionally expunged all the crosses from the blue-domed churches of Santorini, with no premeditation, no predetermination, and for no particular reason at all? Does Lidl UK think its customers are idiots? Now, we can quibble over a branding decision for marketing purposes: non-Muslim customers aren’t likely to purchase Lidl’s own Halal range if it’s all emblazoned with mosques and crescents, are they? The objective is sales; the motive profit. So why lie about it? The cross is indeed offensive to those who are being lost: ‘And I, brethren, if I yet preach circumcision, why do I yet suffer persecution? then is the offence of the cross ceased‘ (Gal 5:11); ‘For the preaching of the cross is to them that perish foolishness; but unto us which are saved it is the power of God‘ (1Cor 1:18). And so Lidl UK joins Communist China in abolishing the cross while insisting that it has “nothing to do with religious beliefs”. The question, of course, is whether Lidl’s Christian customers (or those who are offended by this sort of petty censorship) are sufficiently outraged by this saga to boycott the supermarket altogether, and the answer to that, of course, is probably not. But it is interesting that the impulse of Lidl UK was to lie about the anti-religious ( = ‘neutral’) motive, which, far from being unintentional, is purposeful and calculated. It isn’t that Lidl seeks to include all religions equally with an array of appropriately cultural multi-faith images on its products: it is that they censor a certain culture’s religious images under the guise of secular neutrality, or non-aggressive secularity, or social-secular positivism, which is, of course, not neutral at all. One wonders, do they censor all the religious images from their Halal range? Or do they retain mosques with crescent moons unintentionally?